Travel Portland is a private, non-profit destination marketing organization, whose mission is to stimulate the region's economy by supporting and creating a thriving atmosphere of hospitality in partnership with over 750 local businesses. Through their information center, city-centric magazine and carefully curated website, Travel Portland strives to give visitors and residents the tools to fully take advantage of everything the city has to offer. Naturally, a large portion of Travel Portland's online strategy focuses on encouraging interaction by promoting things to do and places to visit. However, despite being a go-to source for all things Portland, their actual event calendar was falling short of delivering. Travel Portland's calendar consisted of primarily static, text-heavy listings with little to no direction beyond a date range to intuitively navigate through the listings. The lack of dynamic and interactive content also decreased SEO optimization, which prevented Portland visitors from organically discovering great event content. In addition to the flat pages, Travel Portland relied on shared access to a city-wide calendar to import content. While this aided in keeping the calendar full, this inhibited the team from enjoying any editorial control to ensure not just consistent content, but also quality content. Travel Portland knew that if they were going to fully realize their goal of driving increases in tourism and business to their city that their online event strategy needed an upgrade. The Travel Portland team quickly recognized that not only would Localist overcome their current administrative roadblocks, but that Localist was the only calendar solution whose core functionality aligned with Travel Portland's goal to interactively display content while simultaneously marketing the city. Adopting a Localist platform has allowed Travel Portland to become independent of the previous city-wide shared calendar, which ensures that the calendar is high on quality, and not just high on quantity. Transitioning from a pre-curated calendar to a fresh slate may seem like a challenging task, but Localist's implementation process is driven by a personal calendar consultant to guide team members, brainstorm tactics and offer best practices every step of the way. Our consultant was awesome - responsive, clear and precise in her communication and knowledgeable about the product at a deep, technical level. Switching to Localist also didn't mean that Travel Portland had to mold their brand or adapt how they market events to their target audiences. With Localist's clean, straightforward admin dashboard, customization is a no brainer, which impressed the team from the start. This means that when users are browsing the website, the transition from Travel Portland grown pages to Localist is seamless. Before Localist, Travel Portland built their calendar in house, which left every decision up to the team, including the best way to structure content to evoke the most interest and interaction from users. According to the team, subjectively deciding which events should be placed on the homepage or in prominent positions was always a vexed issue in the office. Now, Travel Portland can sit back and let Localist take charge of the subjective makeup of the calendar. Localist's patent pending trending algorithm takes user and traffic data and translates the results to the calendar homepage to get not just the most popular events in the foreground, but also the most interesting. Fortunately for Travel Portland, Localist isn't just equipped with an engaging content blueprint, but it is built from the ground up with search engine optimization at its core to drive more eyes to their brand and content. 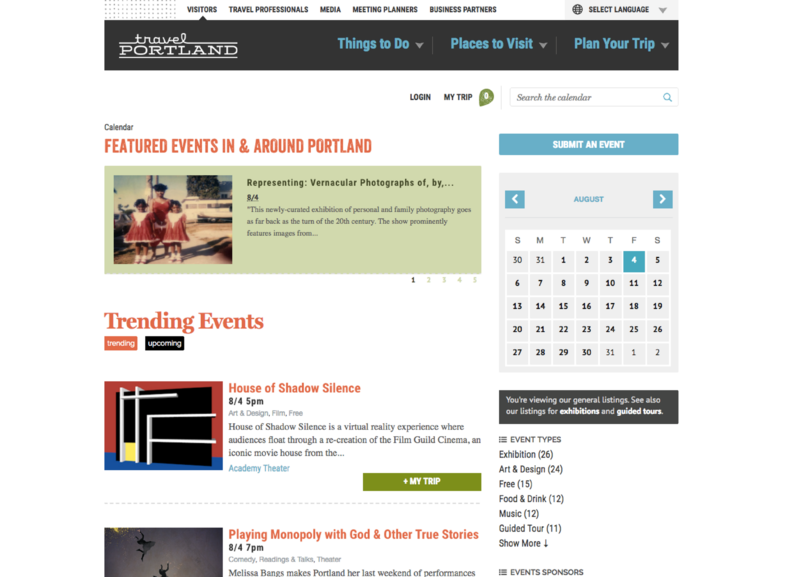 With Localist, Portland residents and visitors can discover quality content as fast and as easy as the Travel Portland team can post to their calendar. Richard and his team recognized this ability through Localist's "great track record of success in academia," which made them confident that the Localist team will continue to invest in its core technology. While you can immediately see the proof of a successful adoption of Localist in the calendar's refreshed layout, added places directory and new trending list, the real transformation is in the numbers. Since launching Localist in the fall of 2014, Travel Portland's events platform has experienced a measurable increase in traffic compared to their previous calendar, and overall site traffic has risen by 45% . So, what does this mean for the Travel Portland team and the city's future? A website that is now a complete and true reflection of the spirit of Portland. Greater brand and authority presence for the Travel Portland team. Increased interaction among residents and visitors as event content is discovered faster and easier than ever before. Are you ready to increase site traffic?